Pantai Tengah is a relatively quieter and peaceful place although it too has one of the best beaches in the island with a long expanse. This is where many returning families and romantic couples tend to stay within a reasonable budget. So unlike Pantai Cenang, the beach activities here are limited. However there are huts on the beach that are home to watersport operators offering all kinds of water based activities like jet skiing, speed boat joy rides, banana boating and lot more. There are several very nice Spas in the area. Most of them offer traditional Malay treatments and massages using authentic and organic spices, herbs & oils. Some have also invented fusion style of treatments. 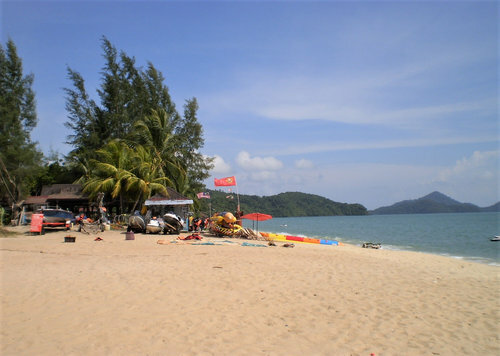 Pantai Tengah also boasts of several excellent operators offering boat tours. In fact the jetty from where the well known Island Hopping boat tour starts, is located in Pantai Tengah near the Awana Porto Malai Resorts (the hotel is now known as Resorts World Langkawi). Note that Para sailing from the beaches is dangerous and illegal in Langkawi. However even in recent times I have seen tourists unknowingly doing para sailing from Pantai Tengah beach. Some unscrupulous operators having no license continue to offer para sailing with parachutes taking off and landing at the beach. Due to coconut trees, resort buildings etc, there is always a high risk of entanglement or impacts. There has been several major accidents in recent times. They offer several cruises including sunset dinner and cocktail cruises, standard day cruises and even private charter cruises. Tropical Charter also organizes various tours including Jungle Walk, going around the island and experiencing the villages, fruit orchards, waterfalls etc. Other ooferings include mangrove tours, organizing spa & retreat packages wherever you want etc. There are huts on the beach of Pantai Tengah about 50 yards to the left of the Lighthouse Restaurant & Beach bar that offer several water sports. As you approach the operator along the beach, you can see a number of speed boats, jet skis, banana boats and many different kinds of floats and other water gears lined up and kept ready for tourists. This is one of our favorites when it comes to getting into the water at Pantai Tengah with a jet ski or a speed boat. They are open from morning (about 8am) until sunset. Awana Porto Malai Resort (now known as Resorts World Langkawi) in Pantai Tengah organizes a series of recreational and watersport activities from its own waterfront area. They are located at the southern end of Pantai Tengah and has a boardwalk along the waterfront and a dock from where they operate. As an outside guest, you too can avail the activities here, however the rates are on the higher side. There are other third party operators who too operate from the Awana Porto dock. This is the new branch (after the one in Cenang) and located at the Sun Mall in Pantai Tengah. They offer several packages with different combinations of head & body massages, body scrub & wrap, hair treatment, facials, herbal compress etc. This is a great Malaysian Spa where experts local therapists do the treatments. It's located in a rainforest up the hill. It may be a little difficult hike for some, but it really makes up with its charm of Malaysian style huts where the treatment rooms are located. A wide range of Malaysian treatments and massages are offered including scrubs and bamboo massages. Located in Pantai Tengah and opposite to Holiday Villa, this is a cozy little budget spa set up in a garden setting and offering several spa packages including full body aromatic oil massage, scrub & wrap, head massage, manicure & pedicure etc. There are four treatment rooms where couples can be accommodated in each. There is also a common area where foot massages, pedicure etc are carried out as you get a lovely view of the garden through floor to ceiling glass windows. 2) Pantai Tengah Area Guide: All information about Pantai Tengah including attractions, activities, hotels, restaurants, shopping etc.